Protesters hold a banner which reads "No Leasing Land to China even for Anytime" during a demonstration against a draft law on the Special Economic Zone in Hanoi, Vietnam, June 10, 2018. Vietnam suspended debate this week over a legislative bill that could bring a flood of investment from old foe China. The move followed several days of massive protests sparked by concerns the bill would invite what demonstrators believe would be a dangerous level of Chinese investment. The bill would allow foreigners, mostly Chinese investors, to lease land for up to 99 years in three special economic zones. The National Assembly had been discussing the bill since November. 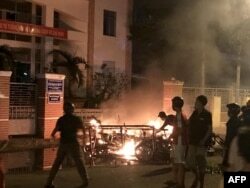 Protesters worried that 99-year leases would "pave the way" for Chinese influence, said Trung Nguyen, international relations dean at Ho Chi Minh University of Social Sciences and Humanities. "They think that the government can be bought by Chinese, and that's the problem," he said. "If you look at surveys of people in Vietnam, the average Vietnamese person is less receptive to Chinese influence than to influence from pretty much anywhere else, and the stuff going on in the South China Sea doesn't help," said Maxfield Brown, senior associate with the consultancy Dezan Shira & Associates in Ho Chi Minh City. Vietnamese resent China over territorial disputes going back centuries, most recently a border war in the 1970s and an ongoing maritime sovereignty spat. Both claim the same parts of the resource-rich South China Sea. One proposed special economic zone lies near the Chinese border. All three may be geared toward tourism investment rather than Vietnam's normal economic staple manufacturing, said Frederick Burke, partner with the law firm Baker McKenzie in Ho Chi Minh City. "I don't think it's really focused on manufacturing, investment and supply chain stuff as such," Burke said. "This is something different." Chinese tourists to Vietnam numbered about four million last year, up 49 percent over 2016, China's official Xinhua News Agency said. They have a reputation for booking hotel rooms in bulk, sometimes effectively barring tourists from Russia, Europe and North America, Burke said. Beijing has also sighted Vietnam for its 65-country Belt-and-Road Initiative, auguring investment in infrastructure that would stoke trade with China. China is already planning a high-speed rail line to the Vietnamese border. Chinese money accounts for 6.8 percent of Vietnam's foreign direct investment. The legislative bill neither specified China nor proposed incentives for Chinese investors, Brown said. But officials felt they needed to work with the protesters, analysts say. So on Monday 87 percent of the National Assembly lawmakers agreed to delay debate on the bill until a plenary session in October. "Now they are doing something like taking a step back, because the protest is like a surprise to them," Nguyen said. "They (could) not evaluate the scale of the protest and the intensity of the protest." The lease provision of the bill will be revised, Vietnam's Tuoi Tre News website said. "I think they can compromise a little bit," Nguyen said. The bill would find more public support if the special economic zones could spark interest by non-Chinese investors in leasing the land, Brown said. Special economic zones "need to be globally attractive," said Adam McCarty, chief economist with Mekong Economics in the capital Hanoi. They might include tax breaks and utility discounts for investors as well as lease deals. China has opened dozens of zones since 1979 to stimulate growth. "The important things about SEZs are, firstly, that they should not be a net annual financial drain on the state and, secondly, they should not distract the national government from improving the overall doing business environment in the country," McCarty said.